« Rant: Boutique Gear Manufacturers, Will You Please Post Your F-IN’ PRICES!!! But I do have to say that based upon several demo videos I’ve seen of the amp, it doesn’t sound half bad at all, and at $159 – no, that’s not a typo – it might just be worth checking out as a practice amp. Some people have actually run this through a full stack, and apparently it rocks. The amp weighs just 13 lbs. That makes sense since solid state doesn’t require huge transformers, but the amp packs 4 gain stages into its design, so it apparently can get some hefty high-gain – at any volume. 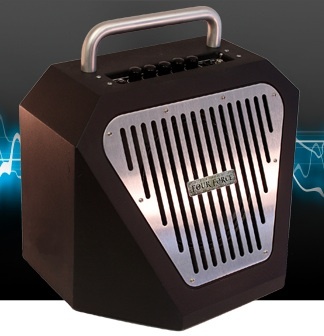 My concern with any solid state amp isn’t sound – heck, my Roland Cube 60 sounds great – it’s response and dynamics with gain, and it’s a reason why I only used my Cube 60 for acoustic. The EM-1 could very well be a different story, but only a live test will determine that. So to be fair, I’ll reserve that judgement until I actually try out the amp. For more information check out the Four Force site! It’s a single page, but it has a bunch of demo videos on it.